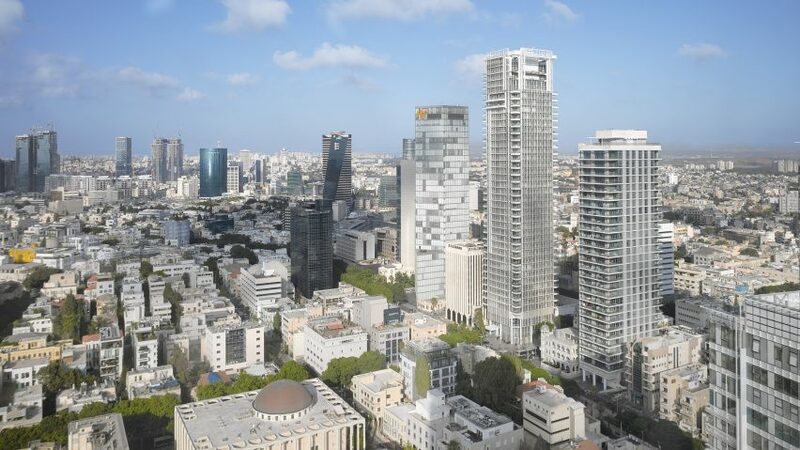 American architect Richard Meier has finished work on his first project in Israel, a residential tower covered in a "veil" of white louvres that ensure the building is in keeping with its Bauhaus-era neighbours in Tel Aviv's White City. Richard Meier & Partners' Rothschild Tower rises 154 metres above Rothschild Boulevard in the centre of the UNESCO-protected White City, which is renowned for its 20th-century architecture. The area is home to over 4,000 Bauhaus-style buildings constructed between 1930 and 1940 by German-Jewish architects who immigrated to the region before the second world war. Their architecture was based on teachings from the Bauhaus art school, which ran between 1919 and 1933, and also drew on elements of modernism. Meier, who is known for his pared-back and typically white buildings, designed a double-layered facade for the tower, which spans 42 storeys above street level. A delicate white lattice of louvres and window frames is created in front of the glazed facades, which ensure an abundance of natural light and views out towards the Mediterranean Sea for residents on the uppermost floors. Each corner of the tower is also fitted with a balcony with a white base that continues the pattern. "The great thing about the site is that it's related to the whole city; it's related to all of the wonderful buildings of the 1930s and to the historic buildings of Rothschild Boulevard. It makes me very happy to be in such company," said Meier. "The design of the buildings in the White City made a deep impression on me when I visited Israel many years ago, so to work in this context has been an aspiration of mine for a long time," he added. "It is my hope that inviting the timeless quality of this city's light and views into an open layout for the residences, a design we haven't seen much here, will bring together the existing elements with a fresh perspective." The louvres stop short of the ground floor, leaving the tall lobby and shop spaces unobscured to create a visual connection with the boulevard beyond. Above the regimented louvres of the main body of the tower a broad "urban window" is framed by the slatted sunshades and secures a view west towards the sea from the penthouse apartments. The tower's other amenities include a swimming pool, spa, wine cellar and lounges. "The tower is deliberately lifted above the street on graceful piloti, with an undulating glass wall in deference to the importance of this important intersection of Rothschild and Allenby," explained Reynold Logan, the design partner in charge of the project. "The transparency and lofty openness of the ground floor lobby, garden and retail spaces contribute to a vibrant streetscape." "Transparency and the related accessibility and connection issues merit respect for the circumstances of each project, especially in dense urban environments," he added. "We well recognise the paradoxical nature of balancing those issues, and at the Rothschild Tower the delicate louvre screen is an elegant white veil inspired by the ventilated protective layers of more traditional Middle Eastern clothing. It is also a 'buffer' of sorts, and obscures the distinction between the public image of the building and the private realm within." Over the last five decades, Meier, 82, and his firm have completed 130 projects throughout America, Europe and Asia. The Pritzker Prize-winning architect runs his New York and Los Angeles-based practice with six partners. Earlier this year the firm, which came in at number 96 on Dezeen Hot list, revealed its UK project – a grand home in the Oxfordshire countryside. This year it has also completed three residential blocks and two charter schools in downtown Newark and released a minimal lighting collection. Photography is by Roland Halbe, drawings courtesy of Richard Meier & Partners Architects.